Sanford-based Adcock & Associates Real Estate & Auction has released its latest in a series of community advocacy initiatives, designed to showcase the qualities and attractions of Sanford and Lee County. 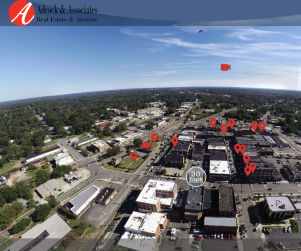 Its brand new Downtown Sanford Virtual Reality Tour allows participants to take a first-hand look into over a dozen of Sanford’s popular businesses and attractions in the venerable downtown area. A simple click on each push pin takes the viewer into the store or destination of their choice. Every click in the virtual reality tour brings a new experience to the viewer. Attractions include a stroll along the Sanford Antique Mall, a visit to Depot Park, a visit to long-time merchants such as Dossenbach Furniture and relatively new arrivals like Karma Coffee, and even a 3-D tour of the Temple Theatre. The interactive site also allows folks to view the popular Welcome To Sanford video, which has been viewed by over 70,000 people to date. Adcock & Associates is the founding sponsor and a major concept contributor to this Welcome To Sanford website.